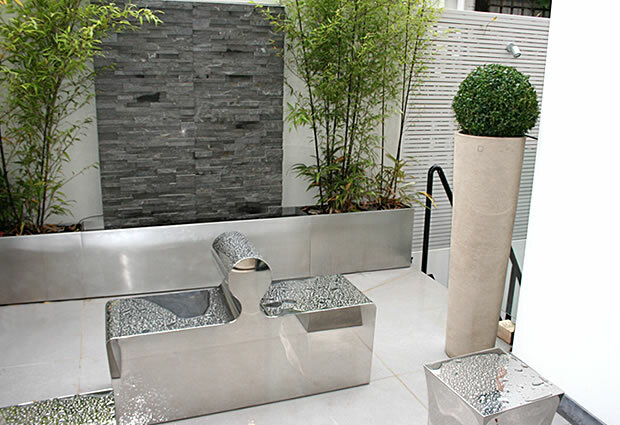 For garden designers, small spaces are always a delight and a challenge.For this contemporary garden design Kensington SW3 the use of space and materials selection were key. I feel that small gardens should have a minimalist approach , with well chosen materials bringing light and space to the area, maximising the sense of space. A strong visual focal point will give depth to the garden adding interest. They key focal point for this garden was to be a bespoke designed slate water wall housed in a stainless steel frame also acting as a planter . The bamboos softens the space bringing rich greens. The parameter walling is a venetian style slatted fence which we kept a light off white colour again to maximise the sense of space and too bring a s much reflected light into the area . We were also considering using a large mirror as focal point which is a great trick to make a space feel bigger. 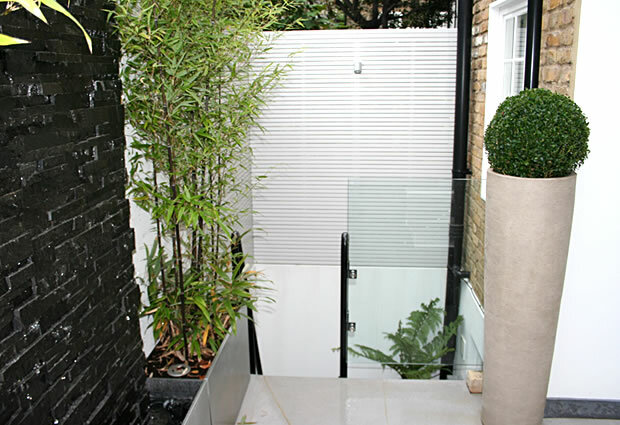 For this garden design in Kensington it was important to reflect the interior unifying the space. Small garden are as much for looking at and enjoying from within as using. This is something that is greatly part of your living space so it has to look great and reflect your sense of style. We used tall slim hand made clay pots to frame the focal point placing in the foreground which also plays a visual trick. The length of the is courtyard is only 4.7m! The paving is a composite as we didn’t not have a lot of depth to build on and we wanted to keep the weight down as this was all mainly built on the rook of the floor below. Large light coloured format tiles increase sense of space and are less busy on the eye. 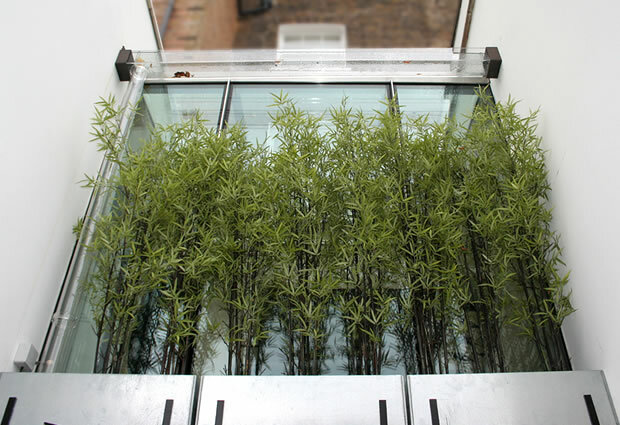 Bamboos to soften and garden lighting creating atmosphere and mood. 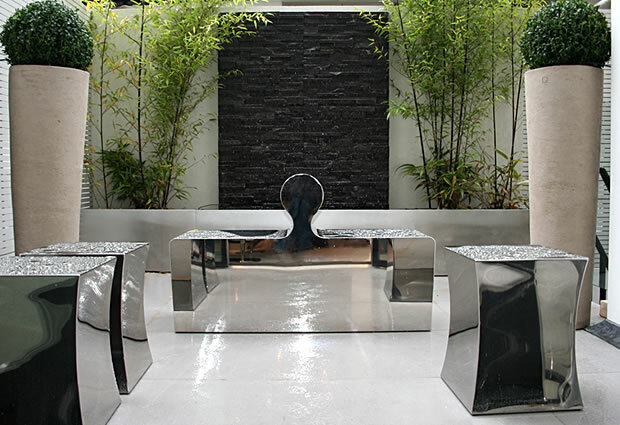 Designer garden furniture and handmade clay planters give stylish and purposeful. Small gardens, small courtyard gardens I feel showed have be easily maintained, have minimalist tones , good features and have carefully selected materials. It was a decision weather to put in furniture due to the lack of space, but leaving it out I felt would detract from the garden’s sense of purpose. The designer furniture is more furnishing than practical seating. I think it really finishes the space. To have a discussion with one our in house garden designers or horticulturalists please get in touch for a free consultation and advice on regarding your project . We will be happy to discuss all of your requirements wether it be a small patio courtyard, large family garden , fully integrated contemporary outdoor room, roof terrace , formal courtyard etc .